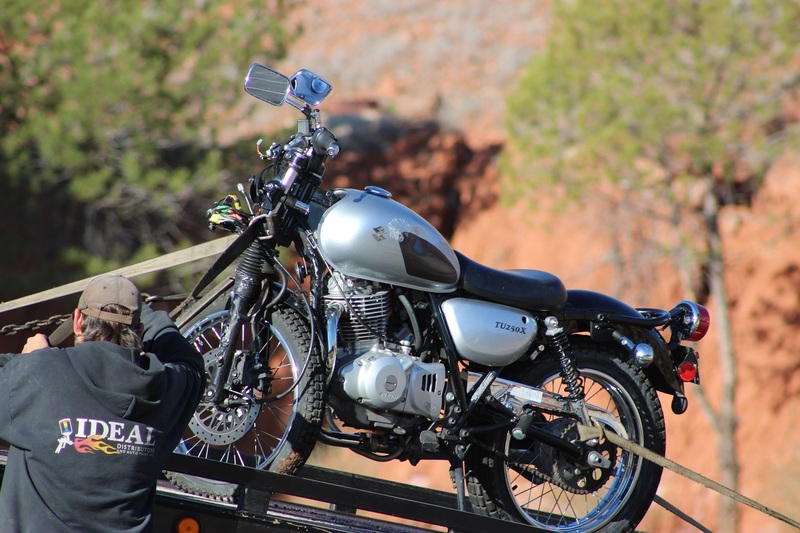 ST. GEORGE — A morning crash left a motorcycle rider injured and a man shaken up after he heard the collision and ran to the scene only to find it was his brother lying on the ground in the middle of the roadway. Shortly before 9 a.m. officers and emergency personnel were dispatched to the crash involving a vehicle versus a motorcycle at the intersection of Bluff Street and West 100 South. 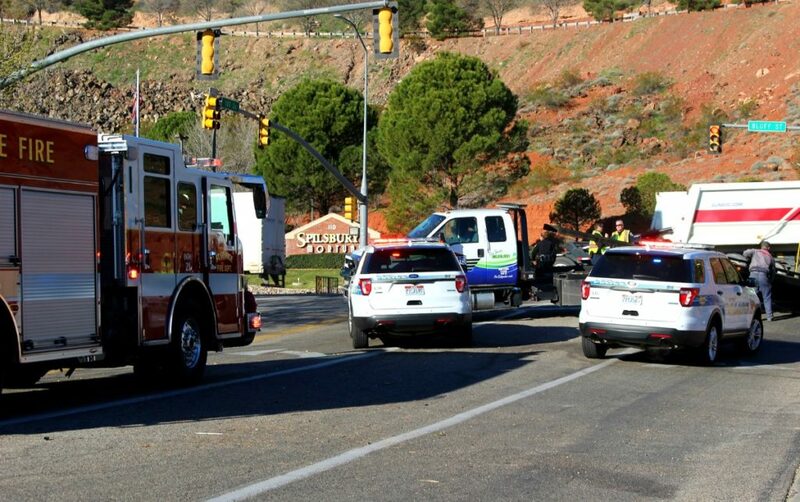 Once responders arrived they found 25-year-old Taylor Squires lying in the middle of the intersection, St. George Police traffic Sgt. Craig Harding said. The crash involved a woman driving a silver Infiniti and Squires riding a silver Suzuki motorcycle. EMS responded and checked the motorcycle rider for injuries, however Squires declined transport to the hospital by ambulance and said his wife would take him to Dixie Regional Medical Center, Harding said. After speaking with the drivers and witnesses, Harding determined the Infiniti was traveling south on Bluff Street and as the driver approached the intersection of West 100 South she moved into the left turn lane and stopped to wait for oncoming vehicles to clear before making a left-hand turn. Squires was heading north on Bluff Street toward St. George Boulevard on his way to work and just as he entered the intersection of West 100 South his motorcycle collided with the Infiniti as it passed directly in front of him, the officer said. The motorcycle hit the rear passenger side of the vehicle, knocking Squires off the bike. The impact threw Squires 10 feet through the air before he hit the ground and slid another 5 feet. The fact that Squires was wearing a helmet meant his injuries were not as serious as they could have been, Harding said. 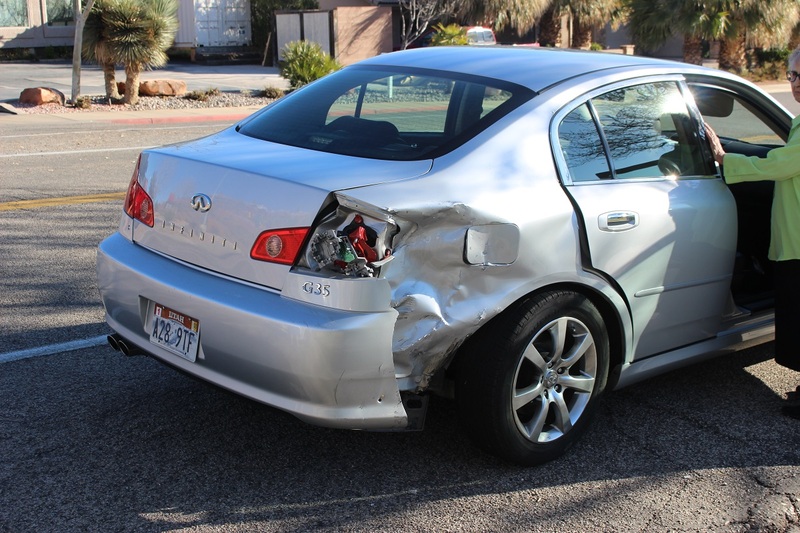 Tom Delong was in his vehicle directly behind the Infiniti while waiting to make a left-hand turn at the light when the crash occurred. Delong said he saw Squires flying through the air before he struck the pavement, hitting his head first. The rider then appeared to bounce before skidding along the roadway just a few feet from his truck. DeLong got out of his vehicle immediately after the crash to check on the rider who appeared to be unconscious, he said. 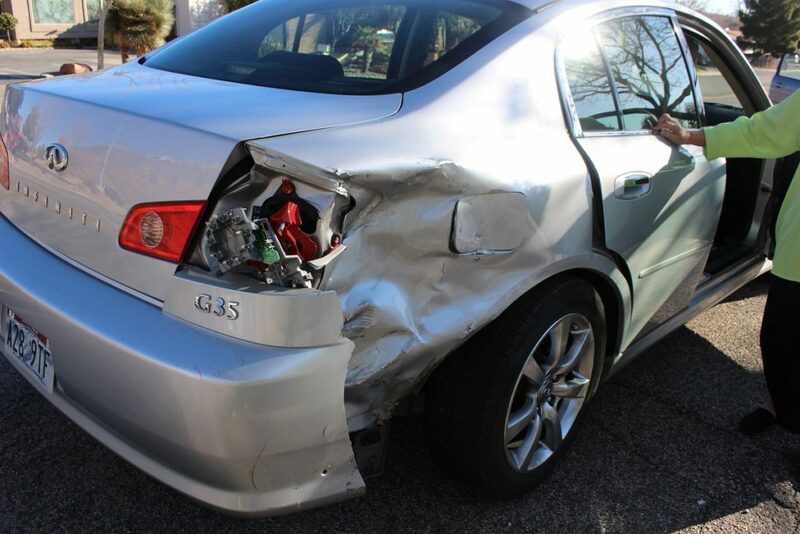 Delong’s daughter approached the Infiniti to check on the two women inside of the vehicle. Squires regained consciousness several minutes later and told officers that the woman pulled in front of his bike and there was no time to react. Squires told St. George News that he was on his way to work and the next thing he knew he was lying in the road after being in a crash. “My wife is here and she’s taking me to the hospital now,” Squires said. Jared Squires, Taylor Squires brother, heard the crash while working at Red Rock Cycles at the corner of where the crash occurred, and said he ran from the building when he heard the crash. Jared Squires remained with his brother while emergency personnel were en route and planned to follow him to the hospital. “He’s still shaking and his wrist doesn’t look very good, and when you have a lump like that there’s something wrong,” Jared Squires said. DeLong was on his way to take his daughter to Dixie State University when the crash occurred, so after giving a statement he dropped his daughter off and returned to the scene to check on the injured rider and to speak with Harding on what he witnessed. The woman driving the Infiniti told officers she believed the motorcycle rider was driving faster than other traffic when the crash occurred, Harding said. But according to statements taken at the scene it didn’t appear that the rider was speeding when the crash occurred, or he would have been thrown farther from the bike at the point of impact. Squires was wearing a helmet, jacket and heavy riding gloves at the time of the crash, “which very well could be the reason he is alive and on his way to the hospital with his wife right now, because the alternative could have been so much different,” Harding said. The motorcycle was damaged and towed from the scene, while the Infiniti sustained rear end damage and was driven from the intersection after the woman was cited for failing to yield, Harding said. Squire’s choice to wear a helmet was important, Harding said, adding it’s a person’s right to make that decision but it does have consequences. It’s when things go wrong that a personal decision is no longer attached to the right, Harding emphasized, stating he believes when a rider is involved in a crash that kills them there are ramifications attached to that situation that go far beyond the individual rider, decisions or rights. “When I go and see a young man laying on the pavement with his head cracked open, and we have to scoop his brains up with a shovel it impacts me and everyone working that scene,” he said. Harding went on to say that the families of everyone at that scene are impacted as well, because they take those experiences home with them, whether they want to or not. Witnessing death at a scene changes people, Harding said, and there’s no way around it. Harding said he can recall 16 people that would still be alive today had they worn a helmet on the day of the crash, and that every one of the riders died as a result of a traumatic brain injury. If they had worn a helmet, he said, they could have walked away from the crash with little more than road rash. The financial impact is even further reaching, he said, because many times it is society that pays when a rider is killed in a crash because the costs must be paid and those are generally paid through higher insurance premiums. “Those costs can be measured, but the costs associated with a young man dying on the roadway are immeasurable,” Harding said. 1. While on a motorcycle you always assume that they’ll turn in front of you. 2. Happy that he walked away..
3. The Speed Limit there is 35. If he wasn’t speeding I’d be shocked. Does anyone slow down from 45 to 35 at 100S?????? To the driver of the Infiniti: Way to try and toss the blame to the motorcycle rider. You are an idiot and have absolutely no integrity. The fact that the rider was not thrown further is scientific proof that he was not speeding. You are a simply a moron, were in way too much of a rush, and thought you could beat traffic. I hope this accident makes you wake up, stay off your phone, and be more considerate of others rather than focusing so much on your self! It amazes me How FAST everyone in St George are Traveling to get to the RED LIGHT. Its has become a Dangerous Thing just to Navigate safely, Thank Goodness this Rider is OK!! START SEEING MOTORCYCLE RIDERS ITS SPRING TIME!!!!!!!!!!!!!!!!!!!!!!!!!!!!!!!!!!!!!!!!!!!!!!!!!!!!!!!!!!!!!!!!!!!!!!!!!!!!!!!!!!!!!!!!!!!!!!!!!!!!!!!!!!!!!!!!!!!!!!!!!!!!!!!!!!!!!!!!!!!!!!!!!!!!!!!!!!!!!!!!!!!!!!!!!!!!!!!!!!!!!!!!!!!!!!!!!!!!!!!!! !